« Is that a Sea Change I See? A couple of months ago my beloved Microsoft Notebook Optical 3000 mouse finally bit the dust. 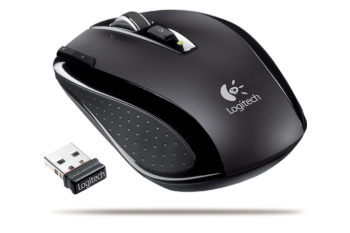 It had provided several years of enjoyable use, probably the equivalent of over 150,000 miles in mouse terms. All trouble-free. Ah well, adieu and Godspeed, my dear worn-out surfing companion. Digging a clunky old tailed mouse out of the spare computer parts box (at least it was USB! ), I went in search of a new mouse friend. The Microsoft Notebook Laser Mouse 6000 would have been an easy choice of upgrade. However, the Logitech VX Nano Cordless Laser Mouse (pictured) quickly got my attention by virtue of its many useful-sounding features, including a cozy travel case, switchable smooth-scrolling wheel, on-off switch, and especially the itty-bitty stowable USB dongle. I chose TigerDirect to purchase my Nano. I’ve found TigerDirect’s prices competitive, their selection comprehensive, their shipping rapid-quick, and although their website sometimes overwhelms me with its busy-ness, I’ve come to trust them. This article by EverythingUSB.com gives a detailed and informative review that I liked and that matches my experience with the VX Nano. I won’t duplicate their excellent work here, just add my own impressions. The mouse arrived lickety-split (delivered by our friendly UPS guy, Jonas) and I put it straight to work. Everything was in order and I found the software quick and intuitive, helping me to figure out the features and user options in no time. The USB dongle is so truly tiny it gets to live in the USB port on the right side of my HP Pavilion laptop. This port has been pretty much unusable up to now, since every other USB device or dongle plugged into it gets in the way of my mousing hand (hel-looo, HP?). The Nano dongle protrudes about a quarter of an inch. I’m serious. See it in the picture? That’s for reals. How did they do that? I don’t even realize it’s there. Yay! One thing that I had not counted on enjoying so much is the free-wheeling scroll button. Wow, if you give that thing a good finger-flick and let go (while in smooth-scrolling mode), you’ll be zinging through pages incredibly fast with minimal effort. You know when you flip your bicycle upside down to work on a tire or brakes or something, and you give one of the wheels a whirl, and it spins and spins and spins until you stop it (or it slooooooowly comes to a stop)? That’s how this scroll wheel behaves. With my Microsoft mouse, I was continually cranking away on that wheel, a figurative and literal pain. With one good zing of the Nano’s wheel, you can sit back and watch pages whip past. Nice. And much gentler on my wrist. I have fallen in mousie love. At $59.99, there were certainly less expensive alternatives out there, but my new Nano fits my needs perfectly and has proved reliable and enjoyable thus far. The price was worth it to me, as the Nano did more than replace my old mouse (RIP), giving me useful and fun new features that improve my life at the computer every day.